Leading up to Thursday's tip-off, The Skinny and Homerism will be previewing each region. We've already covered the Southeast and Southwest regions. Next up is the West, where Duke and Coach K are looking for their 67th Final Four. My ranking is relative to the "best region" that could be assembled this year. Let's face it. There isn't a team in this field that could come within 20 points of the elite Kentucky, Duke and North Carolina teams of the 1990s. With a streaky Connecticut at the 3 seed and one of the most talented teams in the country in Texas at 4, the selection committee didn't just hand the Dookies a ticket to Houston. Rounding out the bracket with Mizzou, Memphis and Oakland as double-digit seeds, this a very good – not great – region. I don't think the Golden Grizzlies will have enough firepower to knock off Texas. But, much like Davidson and Northern Iowa in recent years, Oakland can shoot. If the Grizz get hot behind the arc, they could pull off an upset (or two). Oakland is one of the best offensive teams in the tournament. It should make for a good first round matchup against a stingy Longhorn defense. I am not hating on the little guy. Steve Fisher has assembled a very nice squad. But this is really the best 2 seed? The Aztecs are very solid defensively, but there are more Jimmy Kings than Chris Webbers suiting up for Fisher this year. I am not buying SDSU as a legit contender to cut down the nets in Houston. The committee definitely didn't do Duke any favors for by sending the Blue Devils 2,500 miles west to Anaheim, Calif. But what did the good people of Tucson, Ariz., do to deserve the games they'll be forced to watch? SDSU-Northern Colorado, Wisconsin-Belmont, Kansas State-Utah State and Penn State-Temple... I think I would rather watch TruTV's regularly scheduled programming. Fears of the Huskies' exhaustion after last week's Big East tourney run are overblown. Besides, the Huskies could limp down their rather tame path to the Elite 8. Walker is the best offensive weapon in the tournament, and his young supporting has come on strong late in the season. He's no Joe Namath, but Coach Pearl definitely has a creepy old man quality. How long do you think Pearl had been planning that cheap feel on Erin Andrews? If his fashion doesn't offend your decency, the lies Pearl told the NCAA this past offseason might. This was tough call in a region with plenty of star power – Kemba Walker, Nolan Smith, Jordan Hamilton, Derrick Williams. No one, including myself, is giving the Aztecs the respect due to a No. 2 seed. Leonard will have to play well for SDSU to make a deep run in the tournament. Barnes is lucky the only thing on the minds of Longhorns these days is 5-7 and not Final Four. Barnes has arguably the most talented team from one to 12 in the country, but Texas again appears to have peaked in January. Can Barnes finally prove he is capable of winning more than recruiting titles? The Bearcats have the size and athleticism to compete with anyone in the field. Much like UConn, the 'Natti could be the beneficiary of a weak bracket and find themselves in the Elite 8. Believe me, this pains me as much as it does you. Unfortunately, Duke is easily the class of this region, if not the entire tournament. The Dookies are deep, talented, well coached, and they have the one guy – west of Storrs, Conn. – in Nolan Smith who can carry a team all the way. 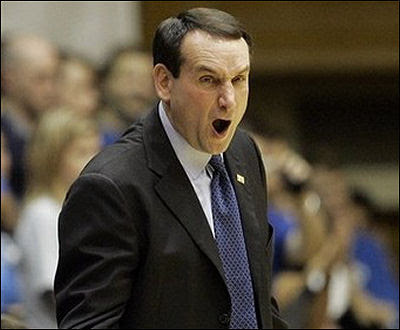 I don't see any way to stop the three-week Coach K love-athon coming out of the West region.